A little bit of sunshine yesterday inspired us to create these beautiful Butterfly Suncatchers to brighten up our windows. 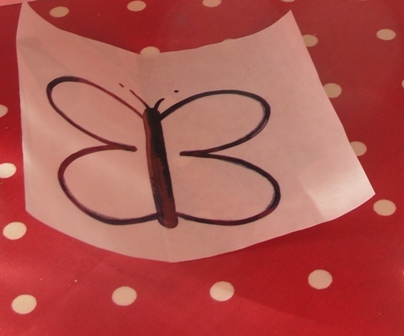 Using a marker pen I drew a very simple butterfly shape onto the non-sticky side of the contact paper, then added 4 small pieces of blu-tack to each corner, & stuck this side to the table with the paper side facing upwards. We then peeled away the paper side, leaving the sticky side facing upwards. Minnie decorated the butterfly shape with her chosen colours of tissue paper. Some pieces were placed down flat, others she scrunched into tiny ball shapes, but each stuck to the sticky sheet. Once Minnie had finished decorating the butterfly shape we add a little glue around the edges of the shape. Then we stuck a clear sheet of contact paper over the tissue paper to seal the paper between the plastic. Once 'squashed' & sealed we cut around the butterfly shape. We pushed a pipecleaner (which we folded in half) into the top of the butterfly to make the antennae. Using a little more blu-tack we stuck one butterfly to our window & one on our door. A bright new addition to our kitchen & a taste of Spring!